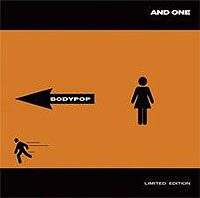 And One have signed with hard electronics label Out of Line, but their last achievement “Bodypop” leans much toward the poppier side.This is a neatly produced album but I seriously doubt it will be given credits for its artistic merits.It will not gain any new fans either, that is , if you loved the band you would like the sounds , if you had not been impressed by And One so far you are not likely to appreciate it now. I personally fall into the second one. ‘Bodypop’ carries strong references to the sounds we know from 80’s wave and electropop and such acts like Depeche Mode or David Bowie. Nowadays it has been labelled as synthpop, so be it. And One synthpopy side however grows dreary, dull or monotone at best. Steve Naghavi has produced twelve songs using the exact same sounds as always, all gradually falling into some kind of ‘German synthpopy in electro outfit’ leaving you with a terrible deja-vu feeling. It is a decent pop, much too decent, prolonging endlessly and somewhere around the fifth track you find yourself put into a state of lethargy, not to say there is a serious chance you can get bored to death at times. My favourites tracks here are Sexkeit and Traumfrau as I find them somewhat funny and quirky. Overall, this band really needs some new pounding hits, and as regarding to synthpop And One has failed to be much gifted this time.